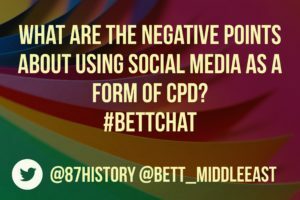 Tonight, I have just hosted my first #Bettchat with @Bett_MiddleEast focusing on the topic of teachers using social media for professional development. 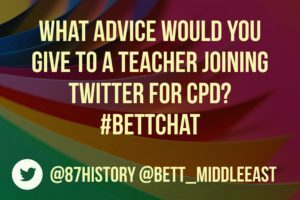 If you are not familiar with #Bettchat it’s a Twitter chat, similar to the weekly #UKEdchat, where questions are posed and people respond on Twitter using the hashtag so others can read their responses and reply… simple! 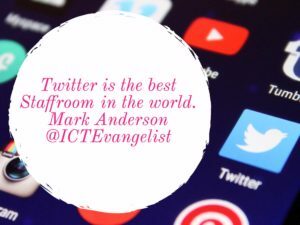 A Twitter chat is a powerful method of connecting educators worldwide, to all be involved in one specific discussion or debate online at the same time despite distance or time zone. 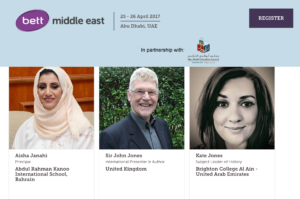 On the 25th and 26th of April I will be attending Bett Middle East in Abu Dhabi. This is a two day conference focusing on digital innovation and leadership within education. I have been asked to speak on a panel, chaired by Steph Bernier, from Victoria International School Sharjah, alongside Mark Anderson aka ICTEvangelist from the UK and Osama Abujafar, Assistant Head of Primary school at Raha International School. The focus of the panel discussion is: How social media platforms can contribute to a teachers’ professional development. Methods of using Facebook, Instagram and Twitter to connect with other teachers globally and create a shared knowledge base. 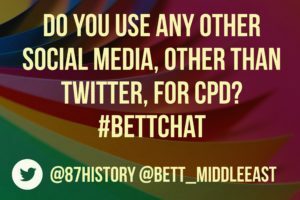 Below, are the questions included from the Twitter chat tonight and you can search the #Bettchat to read the discussion and answers ( I will aim to Storfiy the chat too!). I wanted to share my answers to the questions below in more depth than 140 characters. 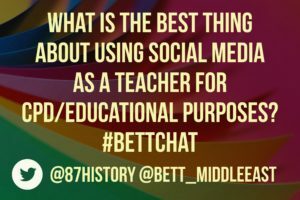 I am very interested to hear what other educators think about social media and how, if they use it, has it impacted their professional development. Q1. Obviously all teachers involved in the Twitter chat are actively using Twitter for professional development but I was keen to find out what, if any, other forms of social media teachers are using. I use Twitter more than any other social media for professional development. Prior to creating a teaching account I rarely used Twitter, as my friends were using Facebook and I only visited Twitter to follow and read up on certain trending hashtags, occasionally. 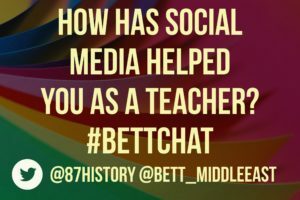 I was oblivious to the Twitter community of teachers, which initially I did find odd due to my caution about using social media as a teacher in general. In addition to using Twitter I often use LinkedIn. I have blogged before about the link between LinkedIn and education (which you can read here). I think Linkedin is another fantastic platform for professional development and professional networking. 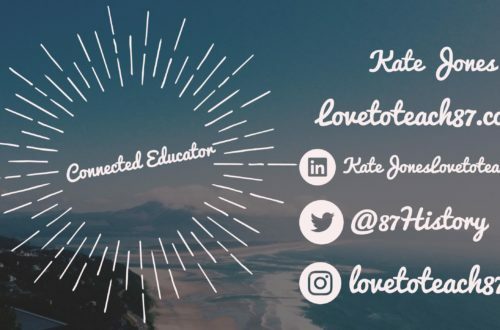 I have two Instagram accounts; one private/personal account with a small amount of close friends and family following and I also have a professional/teaching Instagram account @Lovetoteach87. On my Lovetoteach account I simply share photos of pupils work and resources I have created. I like that the Instagram caption isn’t restricted to 140 characters but there isn’t the same interaction and engagement on Instagram as there is on Twitter, in my experience. I have a Facebook account but that is on lock down with privacy settings and I only accept friends and family. On Twitter and LinkedIn I haven’t actually met the majority of my connections so for that reason I have to be careful about what I post online and publicly. I am still careful with Facebook but I can be more relaxed and the focus is more on my personal life rather than work with Facebook. I do sometimes share on Facebook my teaching and learning blogs and/or if I attend educational events but the majority of my friends and family aren’t teachers – so I am sure this bores them when I do! I did set up a Facebook page to share ideas but again the majority of people who liked my page were my friends and family, not teachers and I didn’t want to use Facebook professionally when I use it personally so I no longer use Facebook professionally. There are educators who are fantastic at sharing on Facebook, Lee Parkinson for example has a large following of teachers on his page but his page varies from useful edtech tutorials to comedy teacher memes! I think most teachers probably use Facebook for personal use and Twitter for professional development – but I could be wrong! Q2. I set up a Twitter account for the Humanities department in my previous school. I really enjoyed using this account; tweeting and sharing pupils work and achievements on a regular basis. The majority of followers were teachers or parents. I think the Twitter account provided an interesting insight for parents and was a showcase of wonderful work and effort by pupils. There are many benefits of running a school or department Twitter account. However, I firmly believe that a policy should be put in place if teachers are to be tweeting from a school account so teachers fully understand what is acceptable – of course apply common sense – a policy provides useful guidelines. For example, what if parents or pupils tweet the account? Other issues can occur about the content and who has access to the accounts. I recently set up a Twitter account at my current school for the Humanities department and despite gaining followers I don’t think people were engaging with the account. I eventually stopped using it although I may revisit the account again in the future. There is a Facebook page for my College which is very popular with staff, parents and pupils. I now email photos or notices to the member of staff responsible for the Facebook account and it is posted online. The Facebook page often generates a lot of interest and feedback. I have used department social media accounts but unless clear policies are put in place then I prefer to tweet from my own professional account. The at times unprofessional, unpleasant and rude conduct that can take place between teachers online – it is shocking considering our profession but I very rarely view this behaviour online. Trolling can happen to children and adults. There are mute and block buttons on social media and they are there to protect people online. Communication between parents and pupils with teachers online can be a difficult issue. At my school we communicate via our school email account and I am very comfortable with this. I can also include other members of staff and line managers into any email communication. Communication needs to be professional and transparent and through the correct procedures/ methods. I won’t respond to emails late at night, unless a serious emergency, but instead I will reply at a more appropriate hour. Finally, I think social media can (not always) have a negative impact on work/ home life balance. For example, when on holiday or with friends and relaxing it is time to “switch off” if possible from work. 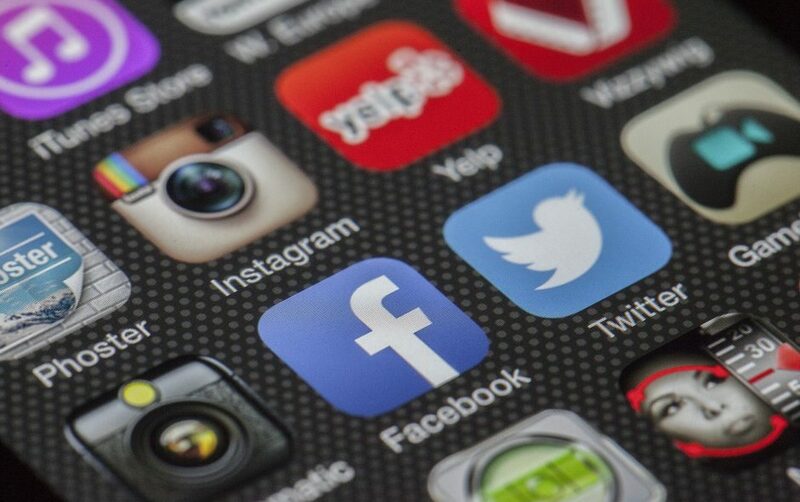 A professional social media account can easily draw the owner of the device back to the teaching community at a time when it may not be appropriate. Of course, this depends on the individual and many teachers on Twitter will tweet “Going on holiday I will be offline!” a clear message…I am with my loved ones and/or relaxing so I am staying off Twitter for a short while! Good idea. Q4. Social media has helped my development as a teacher in so many ways! I am not exaggerating when I state that social media has transformed my career. It has transformed my career in many ways. For six years I was working in a History department with one other member of staff, my line manager at the time, and at times teaching can be very challenging, difficult and sometimes isolating. Social media provides a huge online network of support and inspiration. 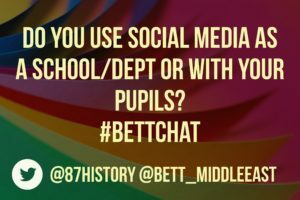 I’ve have gained so many ideas and access to resources for my classroom so not only has social media helped me but also helped my pupils. I was unaware of ‘TeachMeet’ events that were taking place across the country until I joined Twitter. I attended my first Teach Meet event in London and at my second event in Liverpool I presented sharing some AFL ideas. I then went onto organise and host two events in the area I was teaching. 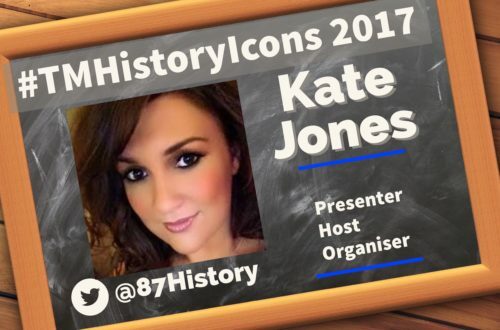 I now regularly speak at events both in the UK and UAE and my confidence as a practitioner and presenter is continually growing. I have recently blogged about my CPD calendar this academic year here – a very busy calendar indeed! As a result of social media, I read more from books to blogs. I now have my very own blog and was nominated for UK Education blog of the year. I am now engaged and in control of my own professional development as a direct result of social media. I have also had so many wonderful professional opportunities as a result of my online presence. Q5. My advice would be to follow a range of teachers, educators, leaders etc on Twitter. When I joined Twitter I followed various well known accounts such as @TeacherToolkit and @TES, both accounts are a great starting point. I was reluctant to tweet or get involved with discussions and I can understand why Twitter can seem intimidating at first. However, after a short while I started sharing and I was surprised by the response and engagement from other teachers. Twitter isn’t a competition about likes, retweets or followers it is an online community who all share a genuine dedication and commitment to teaching regardless of what views each hold. Another tip is to follow hashtags such as #UKEdchat and #PedagooFriday to see what other tweeting teachers are putting out there! Q6. I have probably covered this already but the best part for me about social media is the access to an online, global network of teachers at your finger tips. If you want advice, support, inspiration, feedback or to discuss topical issues in education then social media, like Twitter and Linkedin, is the place to be! Social media provides teachers professional development when and where they want or need it. I have also met so many wonderful, passionate and truly inspiring educators online and at educational events where I have been able to stay connected again through social media. There are so many exciting opportunities to help teachers develop, progress and learn everyday through social media…get connected! 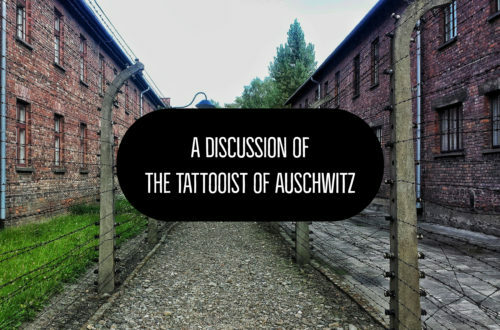 Thanks for taking the time to read this post. If you are on social you can follow my various social media accounts listed below or if you have any feedback then please get in touch using the contact page on my blog. This is such a detailed post. Thanks for sharing. Thanks for including my quote too!